A pretty dull week, not that I am complaining. I got a lot done, not as much as I had hoped, of course. I still have tons to do before the next photo shoot which is approaching faster than I had hoped. I started the Fashion Framework article on skirts and decided it needed samples so I routed around through my stash to find yarn to do sample doll skirts. After the socks, those come next. Very few lessons arrived this week. Ladies (and Gentlemen) please keep me busy! I like to review at least as many lessons as new students. This week I had far more new students than I had lessons to review. As I've mentioned before I send links to my DropBox where I store the course materials. It takes much less time to send the links. Sometimes there are problems with this, depending on the service you use. If you don't get it, check your SPAM folder first. I can also send PDF files or mail you the materials if there is a problem. I want to see the selvedge stitches which means you should work them in pattern. This lets me see if there is a tension problem. Selvedge treatments generally obscure any tension issues. What do I mean by selevedge treatment? 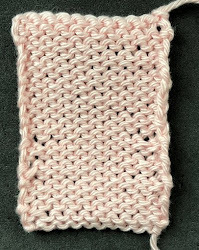 The most common one is to slip the first stitch of every row. This produces a chain on the side. The photograph shows two swatches. 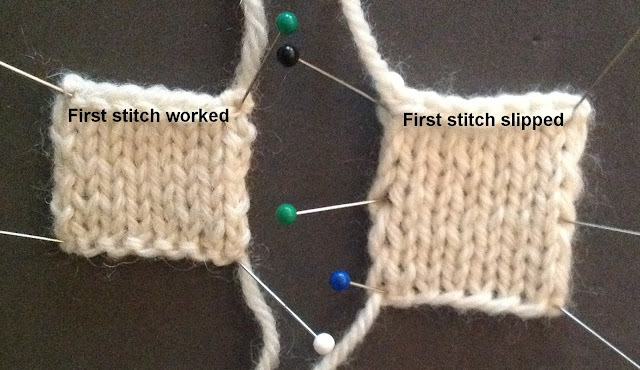 One where the first stitch has been worked, the other where it is slipped. When would you want to use a selvedge treatment? Don't ever use this for an edge which will be seamed or used to pick up stitches. As you can see in the photograph, the slipped stitches span two rows. This does not provide a sturdy edge for either a seam or band. The time to use a selvedge treatment is if the edge is not going to be finished. It does provide an attractive edge. I used selvedge treatments on two of my latest projects, the bottom edge on the side-to-side garter skirt and the shawl which has a garter border. I find this a better looking edge for a garter project. There won't be a salon again this week. I will be teaching the third session of the finishing class on Sunday. 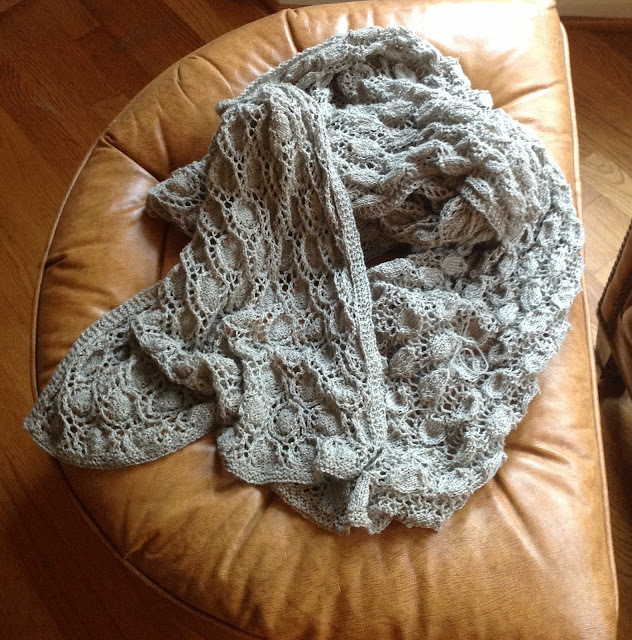 I am going to use my Saturday to write the pattern for the shawl. Next week is another opera so I won't be hosting a salon until November. I don't know what it is about my work ethic but if you give me two weeks to do something, it is going to take me two weeks to do it. I thought I'd have the shawl completely finished and blocked by mid-week but it took much longer than I thought. I kept making stupid mistakes which required ripping it out. It is a fairly complicated lace pattern but it got ridiculous. I finally finished it this morning. 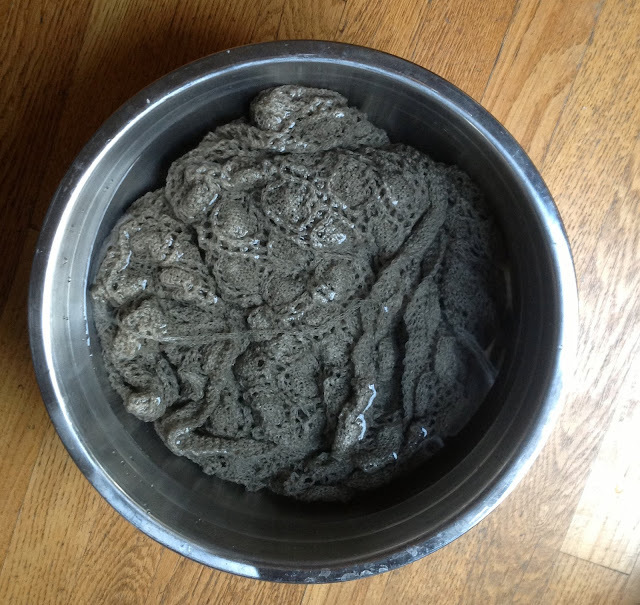 One of the great things about linen is how quickly it absorbs water. It was completely wet within 10 minutes. As soon as I finish this blog, I am going to block it. It should be around 80" long so this will take some time. I'll photograph it as it blocks. The other great thing about linen is how quickly it dries. It is a sunny day here and I generally drag things to my deck to dry.